13th (Forest of Dean)(Pioneers) Bn, The Gloucestershire Regiment, 39th Division, B.E.F. The 13th Gloucestershire Regiment (Forest of Dean Pioneers) were formed by Lt-Colonel Webb at Malvern, mostly from miners and other men suitable for pioneer work from the Forest of Dean. Arthur Kyte joined the battalion sometime in January 1915. The Pioneers camped for sometime on Peachfield Common – only a few minutes walk away from Kyte’s home. Colonel Webb also raised the only Pioneer Battalion of the Worcestershire Regiment – the 14th (Severn Valley Pioneers) – which went on to serve as pioneers to the 62nd (Royal Naval) Division. To read more about the 13th (Forest of Dean Pioneers) Gloucesters click here. 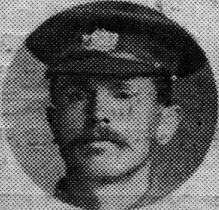 The official publication Soliders Died in the Great War record Pte Kyte’s death as “Killed in action France & Flanders 24/3/18”. This may indicate the day he was reported missing from his unit, and possibly indicate the day on which he was wounded.